Oscar® nominee Luhrmann (“Moulin Rouge!”) directs the film in 3D from a screenplay co-written with frequent collaborator Craig Pearce, based on Fitzgerald’s book. Luhrmann produces, along with Catherine Martin, Catherine Knapman, Lucy Fisher and Academy Award® winner Douglas Wick (“Gladiator”). The executive producers are Academy Award® winner Barrie M. Osborne (“Lord of the Rings – Return of the King”) and Bruce Berman. Two-time Academy Award®-winning production and costume designer Catherine Martin (“Moulin Rouge!”) also designs with the director. The editors are Jason Ballantine, Matt Villa and Jonathan Redmond, and the director of photography is Simon Duggan. 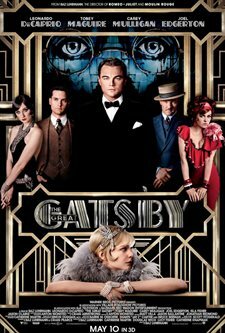 Download The Great Gatsby in Digital HD from the iTunes store. The Great Gatsby images are © Warner Bros.. All Rights Reserved. Director Baz Luhrmann who lost with Moulin Rouge and lost again with Australia, takes a chance with an F. Scott Fitzgerald novel The Great Gatsby turning it into a pop-up book for the screen. While the CGI and sets do sparkle, he turns the storyline into a simple predictive tome set in an era of flappers and illegal booze. Luhrmann gets caught up inside of Fitzgerald's bittersweet romance while undervaluing the class struggle between the newly rich and the struggling underclass. The movie centers on Nick Carraway (Tobey Maguire) who narrates the story about love, lust and retribution after moving in next door to millionaire Jay Gatsby (Leonardo DiCaprio). With wild parties nearly every weekend the Gatsby estate attracts the rich and famous. 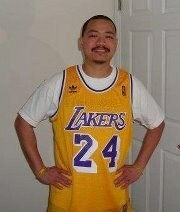 One day he gets an invitation to one of his massive events and decides to go over and meet his neighbor in person. With the revelry in full swing he walks onto the estate with invitation in hand. What puzzles him most however is why the other guests did not receive a printed invitation. During the party he finally meets Gatsby who takes a shine to the budding novelist. Carraway, seemingly the only person in the story with less than 100 dollars in his pocket, enjoys this new found amusement and relishes in the fairytale atmosphere. But there's more to his invitation that meets the eye as Carraway finds out when Gatsby asks about his cousin Daisy Buchanan (Carey Mulligan) a socialite who lives in the estate with the blue light. The plot spools out involving Daisy the golden girl, her husband Tom (Joel Edgerton) and several other intriguing characters drawn together over Gatsby's rise to big money and a love loss past. Luhrmann's makes his sets in The Great Gatsby the center of attraction much like he did in Moulin Rouge. Each setting has its own visual style with billowing white sheets for curtains at the Buchanan residence, huge bouquets of flowers at the Gatsby estate and then turns to the dimly lit speakeasies along roads that connect the island to New York City for contrast. 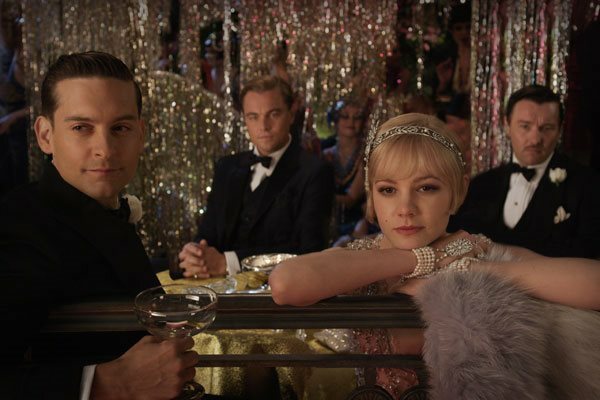 His costumes feature flapper dresses, furs, flowing gowns, wide lapel tuxes, and Gatsby's pink suit providing the feel of wealth prevalent throughout the film. The visuals at Gatsby's social events steal the show as the characters finger long cigarette holders, males thumbing suspenders, wrists laden with jewels, flashy 20's expensive cars and shimmering sequenced outfits don curvaceous dancing party goers. The movie's a set decorator's dream come true with the help of some excellent CGI. While the characters are well acted, they seem to be paper cutouts on a stage that's a pop-up book. As the scenes change, another set pops up to view and we see the actors being lead around as if on strings as they deliver their lines. Although the movie feels very shallow at times what entices however, are the pop-ups that create underclass showing the unprivileged who scrape out a living running gas stations at pennies per gallon with a speakeasy in the rear. A very interesting part of the film's story that I feel Luhrmann could have developed showing the mire and treatment of a part of society that survived serving the rich or providing a release from their boring lives. Luhrmann does an injustice to his actors by making them string puppets that he leads around on a stage so lavish that it detracts from their performances making them readers of scripts rather than character developers. Some of his characters do survive Luhrmann's garishness however, including Joel Edgerton who creates Tom Buchanan a man whose future starts slipping away from the moment he meets Gatsby and Jason Clark as the gas station attendant that's crazed with jealousy over his suspected cheating wife Myrtle. Unfortunately, while Isla Fisher does an excellent job of portraying Myrtle, her character's lack of screen time doesn't give her enough importance. Her character development is so weak that it loses the empathy needed for the audience to accept her lowlife situation and the tragedy that besets her. While I usually like the acting of DiCaprio, his character in The Great Gatsby seemed at times too fragile and sometimes overstated. There was very little chemistry between Gatsby and Daisy (played by Carey Mulligan) for me to believe that the romance between them was ever real. The two seem to get lost in the script and it becomes more of a Joel Edgerton film as the rebuked husband and his settling of the rivalry between Tom and Gatsby. While Tobey Maguire does his best to be the good guy avoiding confrontations from both sides of the affair, his turgid performance negates any true value for his Carraway continuing in the film after the initial coupling of Gatsby and Daisy. If you feel an urge to go see the film you will at least takeaway the breathtaking beauty and wonder that Luhrmann always brings to the screen. And, if you read the book, you'll find F. Scott Fitzgerald's The Great Gatsby pretty close to the storyline within the long winded two hour and twenty minute narrative. The Great Gatsby has been rated PG-13 by the MPAA for some violent images, sexual content, smoking, partying and brief language. The story itself will probably keep anyone under 18 away from this costume period piece even the tweens trying to poke their heads into the auditorium. The 3D is not necessary unless you want the full effect of the depth of field, some swirling cameras that spin around the room at lavish parties, confetti in your face and other effects that only the special eye glasses can give you. The Great Gatsby images © Warner Bros.. All Rights Reserved. This movie is good, not great. I Would say: The Great Leo! Fantastic?! Leonardo DiCaprio FANTASTIC ACTOR! The Great Gatsby Gonna Awesome!